As the world’s most populous nation and one of its fastest growing economies, China must be included in any discussion of global energy demands and international efforts to curb greenhouse gas emissions. 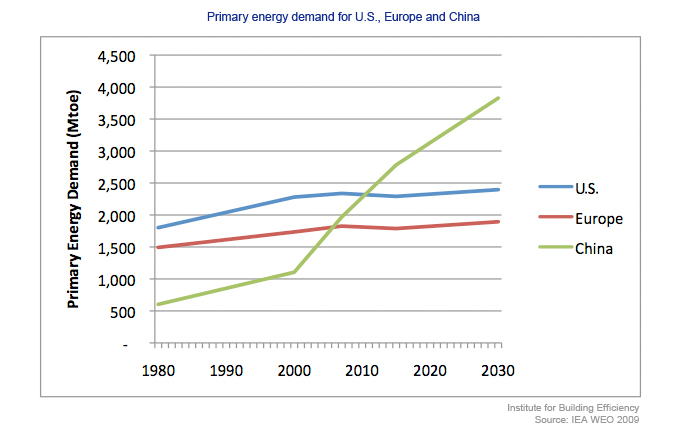 As illustrated in the chart below, drawn from data compiled by the International Energy Agency and published in the 2009 World Energy Outlook,1 China’s primary energy demand recently surpassed that of Europe, and is now on par with U.S. demand. In coming decades, moreover, as Europe and the U.S. experience modest growth in primary energy demand, China’s demand is expected to soar dramatically. With an estimated 15% of the world’s carbon footprint today2 significant and large scale efforts to meet a portion of its growing demand through clean energy solar and wind technologies. and rapid growth in energy demand expected, China will be increasingly central to international dialogue addressing global climate change. Indeed, much discussion has already centered on China’s significant and large scale efforts to meet a portion of its growing demand through clean energy solar and wind technologies. A key piece of the energy and climate puzzle for China and the world will be China’s expanding stock of buildings, as it seeks to provide homes and workplaces to the hundreds of millions of Chinese citizens expected to move into urban areas over the coming decades. Not only does this booming construction offer a singular opportunity to embed efficient and sustainable practices at minimal incremental cost (see Green Buildings), but many existing buildings constructed in the past decade or two represent a sizable opportunity to reduce energy use through retrofits and other energy efficiency investments. Given the global implications of its construction boom, China will be, necessarily, a central area of focus for the Institute. In the coming months, look for more from us on the critical needs and tremendous opportunities for improving the efficiency of buildings in China. China Energy Group at Lawrence Berkeley National Lab: Mark Levine, one of the original forces behind the research efforts of this group over the past 20+ years, has recently launched an initiative around buildings in China. See the Building and Construction section of the China Energy Group website for more information. ChinaFAQs: a project facilitated by the World Resources Institute, provides insight into critical questions about Chinese policy and action on energy and climate change. 1 International Energy Agency, World Energy Outlook 2009 (Organization for Economic Cooperation & Development, 2009).